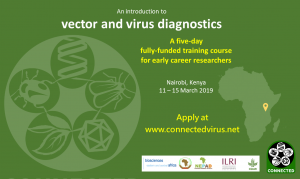 Early career researchers have a golden opportunity to apply for full funding to attend a five-day introductory level vector and virus diagnostics course in Nairobi, Kenya, in March 2019, which is being run by CONNECTED in association with Biosciences eastern and central Africa – International Livestock Research Institute (BecA – ILRI) Hub. 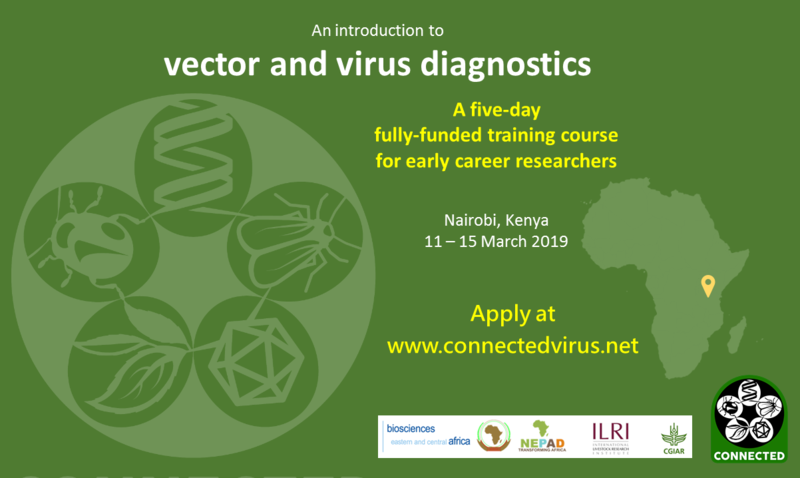 ‘An introduction to vector and virus diagnostics’ will run at BecA-ILRI Hub in Nairobi from Monday 11 to Friday 15 March. The partnership arrangement will fully fund travel, accommodation, subsistence and all training costs for 12 successful applicants. All CONNECTED network members who are early career researchers are eligible to apply, with preference given to those based in countries in the OECD DAC list. Early career researchers are defined as those who have received their highest degree (BSc, MS or PhD) within the past seven years. Applications are now open, closing at midnight on Sunday 9 December, using the application form which you can find here. To read the full application guidance notes please use this link. Applicants will be notified of the outcome during the week beginning 17 December. Successful applicants will be required to provide a short report on the course and its impact on their professional practice.